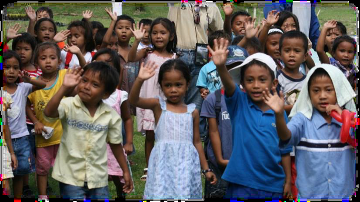 Like Haiti, the Philippine islands are frequently affected by natural disasters that cause large scale destruction and harm to the population, especially the most vulnerable - the children. 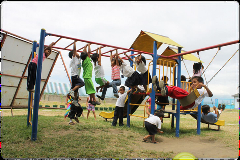 In addition to the geographic challenges widespread poverty makes for extremely difficult circumstances for children to grow up in. With over 44 % of Filipino children living in poverty, 1 out of 3 Filipino children experiencing some form of abuse and the island nation being the 4th most accident prone country in the world, the Philippines lead some sad statistics (all numbers as reported by our partner on the ground). That’s why our project partner specializes in child protection advocacy and services for abused children as well as in emergency relief. They offer homes for abused children, treatment, and child development services that follow the child for 5 years after they have been re-united with a relative. They further offer health and nutrition education, feeding programs, medical services, assistance for teenage mothers and educational resources for school age children. Lastly, they respond to the needs of poor children and communities after emergencies. Our partner provides not only disaster relief in the form of food and shelter, but also works to help displaced children and families with psycho-social support, rebuilding, rehabilitation and recovery services. To us, the challenges appear never-ending, but so is our partner’s resourcefulness and willingness to work on behalf of the most vulnerable. It’s a privilege to support them in their efforts! "This program is designed to provide temporary shelter to abused, neglected or abandoned children where it is unsafe for them to stay in their homes, relatives or communities. It is also an immediate response to children to temporarily pull them out from their traumatic experience to allow them to heal, process, and recover. The temporary residential care has been running for more than 15 years now, servicing to more than 200 abused children over the years."